Because someone thought enough of me and the friendship we shared a very long time ago, he made the effort to look me up and reach out to me and we began our friendship all over again. This meant a lot to me and it made me want to find someone else very special to me. In early January 2016, I went to Facebook to look-up a friend from junior high only to find that he had died unexpectedly. My school-age friend had died on, 9/11/15, from a goddamn heart attack and a lifetime of undiagnosed heart disease while chalking the local soccer fields as the regional AYSO commissioner. That beautiful, smart, funny and oh-so-athletically fit young man died alone working for others. I was crushed and heartbroken that I had missed him for forever by such a small amount of time. After 32 years of working at the same plumbing and piping company, the Caveman secured a new position at a different shop where he met a mutual friend of mine from that same junior high school and with whom the Caveman had played football in high school. Anyhoo, this new old friend and I talked and texted and I told him of the news of our shared friend's death and the upcoming memorial service which was being held the day after Christmas on what would have been his 53rd birthday. And we went to that friend's memorial service and we cried and we laughed and we paid our respects to the widow and met his three beautiful daughters and told them who we were and we even had a picture of The Boys as they were when they had won their junior high intramural basketball championship. And my new old friend made a very generous donation on behalf of our dear friend. Then we went to my house and talked and laughed and cried for the next 12 hours. And, because the universe has an immense capacity for irony, I recognized a friend of our's at that memorial service that the Caveman and I have known for over 30 years--a friend that the Caveman has worked and surfed with since they were both 20-years-old--and that friend and his wife have been friends with my old friend for more than 20 years! So, basically, I had a friend who knew my friend and I never knew it! I can honestly say that my young school-aged heart loved him; I would never say that he was my boyfriend; we never kissed, we barely ever even danced together and we lived at opposite ends of the City of Huntington Beach. What he did do for me was teach me that which was immeasurable. He taught me how to play hotbox in Over-The-Line; how to do a real lay-up and to shoot from the outside because I was not very tall compared to the other girls in basketball; how to hit the ball to the in-field holes because I was not strong enough to hit into the outfield; how to accept a soccer pass with my non-dominant left foot and stay in my lane and still be a leading striker, and he worked tirelessly to teach me what a screen pass was, which to this day I still really do not understand. 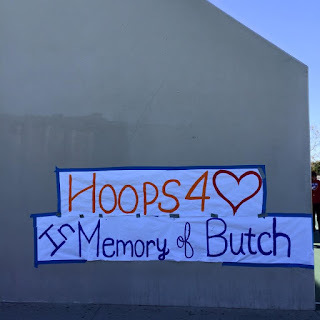 Sorry, Butch. In the last year of junior high, our girls basketball team did not have a coach--no teacher stepped forward to help us. This young man did. He trained and coached and yelled and hollered and stomped on the sidelines. For about a year or so after I moved away to a small Utah town and attended a three-grade high school that was a 1/3 the size of one grade of one of the four(!) 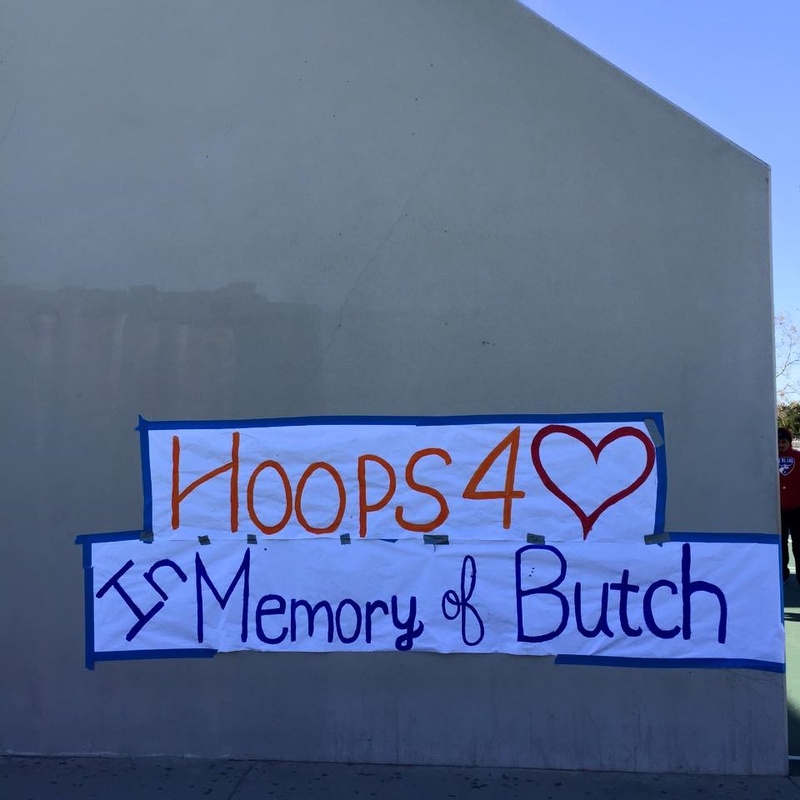 Huntington Beach high schools, we wrote to one another. I still have those letters. I have no letters of Sgt. Airborne's so that gives you an idea of his place in my heart. A big part of my sweet innocent junior high school girl heart broke that day in early 2016; another huge part is sooo beyond grateful for finding my new old friend whom I have known since 5th grade. The moral to the story is this, people: If your heart is so inclined, DO NOT WAIT. Call, text, holler or howl, but get in touch, NOW; otherwise, you may end up missing that friend and he was right there the whole damn time. 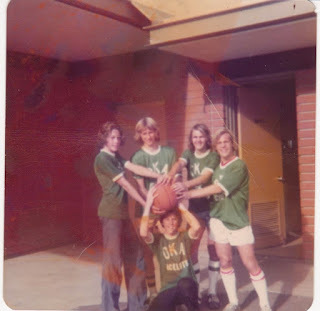 I am on a mission to find one, maybe two, of the three other boys in this picture from 1977... Wish me luck! Because I really do not want to make a habit of finding friends after they have left this earth.